A hard substance which forms the branches and trunks of trees and which can be used as a building material, for making things, or as a fuel. Wood properties depend on moisture content. Wood is a composite fibrous material (cellulose and lignin fibres) that starts to decompose at 550 Kelvin. A durable wood used for palings and posts. A lot of the gums in common use are obtained from varieties of the Acacia. This wood is very durable in water and not so durable in dry conditions. Historically it was used a lot in pumps, piles and sluices. A straight grained, very tough and elastic timber. Used where sudden shocks have to be resisted e.g. handles of tools, oars, blocks and pulleys, spokes of wheels and milk-pails. Ash bark is used tanning and the ashes of ash is used for potash. The wood from Ochroma Lagopus. Used a lot in model aircraft based on the fact that it is light, strong and semi-flexible. A very hard wood almost unaffected when exposed to water. Therefore, it is used for keels of ships and flood gates. On account of its hardness it was used for wheels and railway sleepers. Strong flexible wood that has many uses. 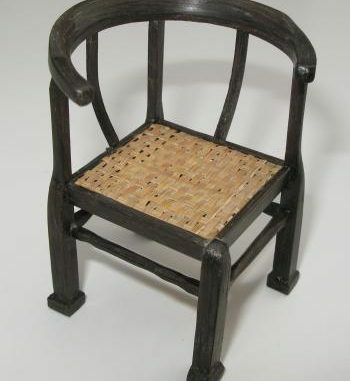 Amongst the uses are furniture making, building as well as being used for agricultural implements in the past. Oak that has been in a bog for hundreds if not thousands of years. 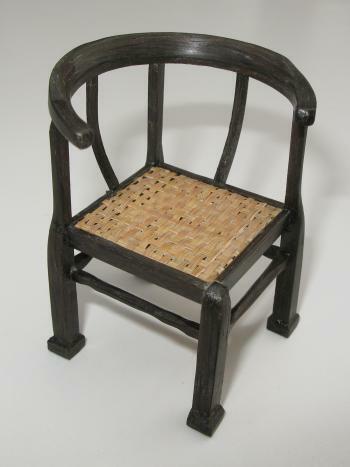 This small 1/12th scale chair has been made from bog oak. The grain is stunning and the wood gets richer as it is polished. The density of the wood can feel more like a balsa wood than oak. 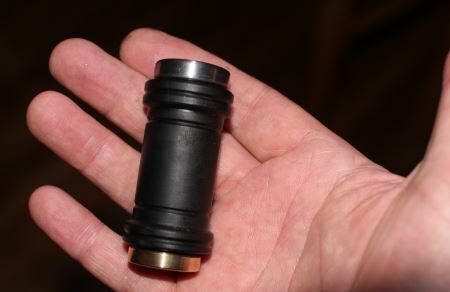 Very compact hard wood suitable for machining small parts from. It is of a bright yellow colour. Considered to the be the best wood for tool handles because of strength and shock-absorbing qualities. Used for sheaves of pulley blocks and bearings in machinery. Tool handles. A durable wood used in ancient buildings. Easy to work and strongly scented. Very durable and much like oak. Comparatively easy to work and does not shrink much when drying. A very dark, hard and smooth wood used for ornamental work. The handle of this palm hammer was made from ebony – I selected this wood as it gives a fine finish and burnishes with time when worked in the hand. A hard, durable and coarse grained wood. Durable even when constantly wet and so used for ship building, piles and paddle wheels. A light coloured and soft wood. Needs to be dried very well before use. The fully developed wood which surrounds the pith. An elastic wood suitable where some degree of bending is required. An extremely durable wood used for rough work. It warps a lot when dried, but can be polished to a fine finish when dry. A very hard wood. Used for machinery bearings that are constantly under water, sheaves of pulley blocks and for purposes where great hardness and strength are required. “Tree of Life” The wood , and sometimes the resin, of several semitropical trees, but most often referring to Guaiacum. A very hard wood that is very durable and can be polished to a fine finish with a rich colour. Less liable to crack or twist in seasoning than almost any other wood. Used to be used by pattern makers for light patterns. The strongest and most durable wood that lasts for long periods in either wet or dry conditions. Used for framing or bearings. English oak considered the best. A North American wood that resembles beech, durable in water but not in air. Thin sheets of wood glued together with the grains running in different directions to improve the strength of the resultant board. In it’s simplest form it consists of three layers of wood with the centre layer grain at right angles to the two outer layers. This construction reduces the tendency to shrink or swell and means that the strength is uniform in all directions. A light wood, but not very strong and or very good wear resistance. Lighter coloured wood on the outside of a log, this wood is more susceptable to rot than heartwood. A strong and durable wood that doesn’t shrink much and is comparatively easy to work. Valuable for many purposes on account of the small amount of shrinkage which takes place with seasoning. The oil contained in the wood prevents bolts and other ironwork from rusting and so is often used for framing. Cross grained wood used for ornamental work.